Despite admitting that he didn't have his Tweet pre-approved and noting that he switched from giving guidance with a 150k vehicle margin of error (350k to 500k), to a closely definitive "around 500k", Musk still believes he is being wrongfully persecuted, and as a result he is doubling (and tripling) down as he now is hell-bent on trying to make fools out of the SEC. 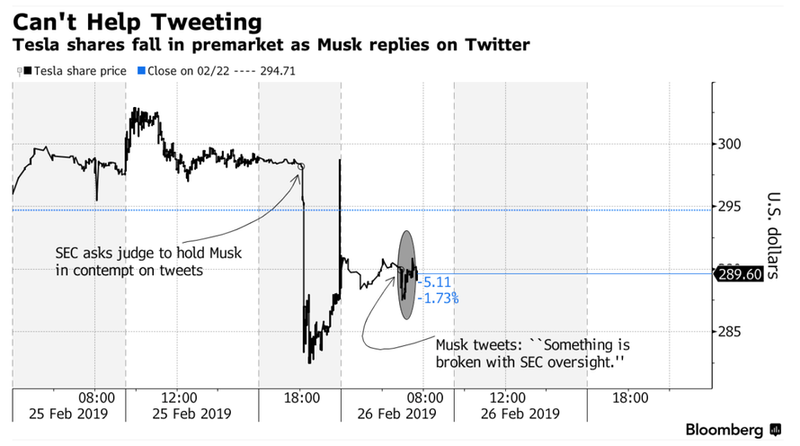 That Tweet was followed up this morning by Musk claiming “Something is broken with SEC oversight” in response to a user’s tweet sympathizing with Musk. All the while, Tesla stock continues to tumble. The stock is trading down 3% in the Tuesday pre-market session. Contempt of court aside, the ongoing barrage of tweets and Musk's attitude continues to ridicule the SEC for settling with him to begin with. Whether or not the SEC will find it in themselves to take decisive action and address the very little integrity that is left in the capital markets remains to be seen.